About Me | Can I Still Drink Wine? My name is Kirsty. 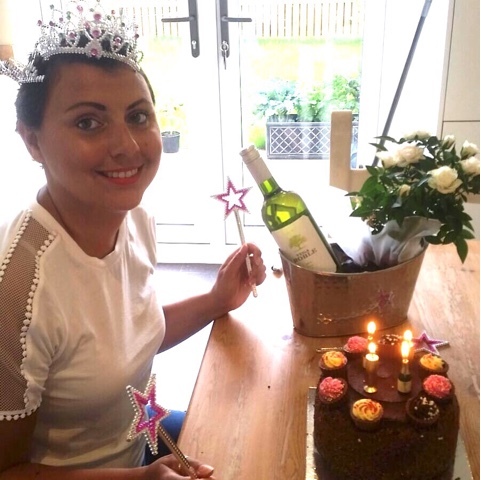 I was diagnosed with Invasive Breast Cancer on the 5th August 2015 when I was 27 years old. My breast cancer was Grade 3, HER positive and ER positive, which basically means I get all of the drugs! Since being diagnosed with breast cancer I have had a lumpectomy, sentinel node biopsy, IVF - to try and preserve my fertility, 6 rounds of chemotherapy, 20 sessions of radiotherapy and a year of Herceptin treatment. I'm currently having endocrine (hormone) therapy, which consists of Zoladex injections once a month and Exemestane tablets every day. I also take bisphosphonates as, because of these pesky drugs, I have Osteopenia. I started writing a blog, as many cancer patients do, for a few reasons. Firstly, it was a great way to keep everyone up to date on my treatment and how I was doing so that I didn't have to relay the same information over and over again when I was already tired from my treatment. I know. How DARE people worry about me?! Secondly, once I started writing I found it very therapeutic. I gained a real love of writing and found it helpful in my on going recovery. Finally, when i was diagnosed I realised there was not a lot of people my age with breast cancer. Everyone in the chemotherapy room seemed decades older than me. I desperately searched the internet for people who were my age and with my diagnosis. I couldn't really find a blog that resonated with me - so i made this one. I don't just bang on about cancer stuff. A big chunk of my treatment is over. I did think about stopping writing the blog but there's a lot more to me than cancer and so I continue to write about it. I really like holidays. Hmm travelling sounds better. I really like travelling. I'm also a massive foodie. So I blabber on about those things quite a lot along with anything else I happen to be doing that might be a bit interesting. I hope that this inspires people, that are just starting out on their journey, that there is life after cancer. So. That's it really. Enjoy the blog and thanks for popping by. P.S. All views are my own. Sometimes its a bit ranty and a bit sweary.